I'm learning a lot in PSE too. It's been quite a learning curve from Piknik but I think I'll like it more in the long run. Gonna go check out Miss Mustard Seed now. :) I could use some bloggy encouragement today. Have a great week Tiffany! Oh, you picked one of my favorite places that we ate at while in Savannah last spring. Garibaldi's is the best!!! Sorry to hear about the migraines. Kate actually did great despite the crazy weather we had roll through (changing her meds, will tell ya about that later). What a beautiful weekend......and I am dying to go to Savannah! Organizing my closet is on my list of to do's today!! Isn't Savannah wonderful? Haven't been there in years but I'd go this weekend if I could. Have a wonderful week ahead, Tiffany! This looks a lot like my weekend! 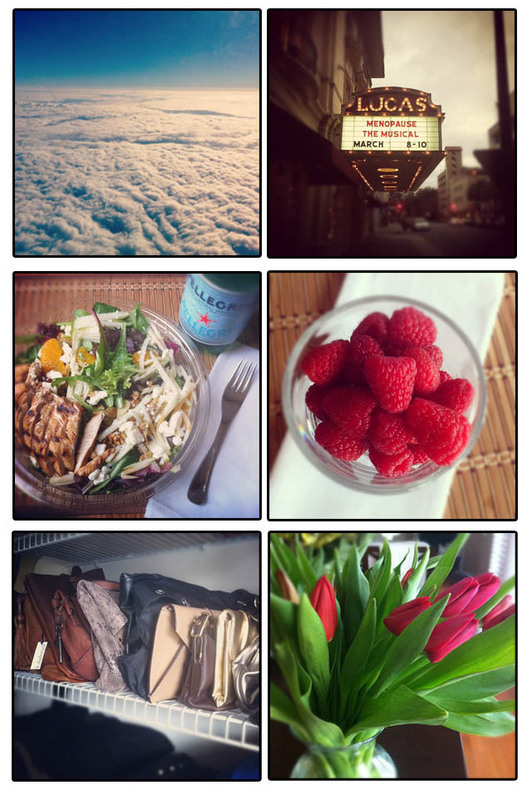 Tulips, salads, fashion! Thx for sharing that post! As a new blogger, I'm still trying to find my way. That post just confirms I'm on the right path. I've always wanted to go to Savannah. .. its on the list! Tulip and organizing make me happy too! Happy to hear you're feeling better, having a migraine is the worst... you're weekend in 6 posts are always great! Organizing also does wonders for me. Sorry to hear about the migraines, that's no fun. Wow! Such fun photos. I love the one with the clouds!